Yesterday, Jello and I took a ride through some of the most picturesque scenery in Riverside County's portion of the Cleveland National Forest, in Southern California. What I've dubbed "Tenaja Trail Ride", it takes you through the hills and canyons following San Mateo Creek, with a distant view of Tenaja Falls, and many breathtaking vistas. Moreover, it's perhaps one of the few loops you can ride on a street bike in Southern California with very little traffic to contend with. In fact, when we rode it, we encountered only a few cars coming the opposite direction across the entire 40 mile stretch. To start, take Interstate 15 into the City of Murrieta, and exit off Clinton Keith Road, and then head west into the Santa Ana Mountains. 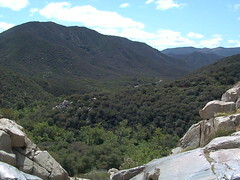 You'll ascend into the mountains to the top of the Santa Rosa Plateau. Follow the road until you reach Tenaja Road, and then turn right. Tenaja Road runs through the community of Tenaja, filled with large million dollar ranch homes, each on several acres of land. The riding through here is actually great, with enough twisties and great views to keep in you 2nd and 3rd gears. Keep your eyes open until you see Cleveland Forest Road, you'll easily miss it if you don't pay attention. Turn right (it's the only direction you can turn), and it'll take you into the Cleveland National Forest. The road narrows into a single lane serving both directions. It's on this road where all the fun begins. The road gets narrow and twisty enough that you'll never get out of 2nd gear. In fact, for much of the road you'll stay in 1st gear, just because the scenery is so great, you won't want to miss it. Jello and I pretty much rode it at 10-15mph with our heads turning and left and right trying to see all there was to see. While still in the Spring season, both sides of the road were filled with a variety of native flora in full bloom casting colors of yellow, white, purple, red, and orange. On either side, we enjoyed fields of green grass with hills and mountains in the distance. It was common to hear birds chirping against the sound of our V-Twins, and an occasional chipmunk trying to get out the way. As the road winds its way into the canyons, it gets bumpy and sandy. Many of the turns are so tight and so sandy, you're moving along at 5mph. If you have any loose nuts and bolts on your bike, now's when you'll start hearing them. About six miles into the ride, you'll eventually come to the Tenaja Falls Trailhead. If you have a Forest Adventure Pass, you can park here and hike the trail up to Tenaja Falls. There actually is water falling here, but only during and after the rains. The hike is about 7/10 of mile. Once there, you'll find a swimming hole and usually a few people taking a dip. Continuing another few miles down the road, it widens and straightens out a bit, allowing you to ride comfortably in 2nd gear, but not yet for 3rd. There are couple places where the road is covered with loose river rock. The first of such places takes you by surprise while you're riding about 30mph; don't slow down, just roll right over it in a straight line. The road finally enters into a small community, and widens up into a two-lane road allowing you to get back into 5th gear. Here it changes names to Killen Trail, and it'll take you along the ridge of the Santa Ana Mountains offering a sky-high view of Lake Elsinore. Eventually it ends at Ortega Highway (Highway 74), and you can either turn left with a mile to go to Hells Kitchen for a beer and a burger, or you can turn right and take the highway down into the City of Lake Elsinore, and get back on Interstate 15. The entire ride, from Clinton Keith Road to Highway 74 takes about 1 1/2 hours if you make no stops. But you'll probably want to stop in a few places just to enjoy the views and hear the silence of nature. WOW! That sounds like such a wonderful ride. The rides with the views, birds, flowers, sights and sounds are my favorites. Except for the gravel, Cleveland Forest Rd sounds ideal. You have some beautiful country there. I grew up in the northern part of California, Sacramento and then the Redwoods area. Thanks for the ride-a-long. You did a great job describing it all.